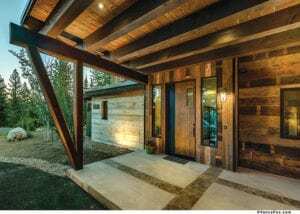 Green building is beneficial to the environment’s health and, as Truckee homeowner Jill Milne and her husband Shawn discovered, the well-being of their family too. After years of chronic illness, it was discovered some rather severe environmental allergies plagued the four-member Milne family. Carpeting, drapes, synthetic fibers—anything harboring allergen pathogens or dust mites—were banned from the plans in order to build a better place to breathe. And, the intention to maintain a functional, modest home was explicitly pronounced. Upon entering the home, the balance between humble and holy mackerel is clear: Practical but engaging. Progressive but not brash. Welcoming but not overwhelming. “We wanted to keep the home lean and simple,” says Milne. And so it is. In the hub of the Milnes’ Gray’s Crossing home is a unique piece of art glowing overhead. Early twentieth century glass insulators are brought to life with copper coils and integrated fixtures—heirloom items from Milne’s mother. The skeleton of the home, composed from countless considerations of the design team, features advanced ventilation, a sophisticated water purification system, LED bulbs, low-E square glass to reduce UV rays, radiant heat, individually zoned rooms to conserve energy and a quick-top, one-eighth-inch thick, clear, nontoxic coating on the concrete floors offering a durable, cost effective and appealing look. As active community advocates, the Milnes employed local products and people. Anna Lambiotte, of Studio Lambiotte, was not only a primary designer, but also the Milnes’ neighbor. SANDBOX Studios’ Scott Gillespie created the building blueprints while Greg Beardsley of Alpine Landscaping designed the outdoor spaces. Lead superintendent Stephan Ryder went above and beyond (quite literally)—he created the magnificent insulator light fixture constantly casting a repurposed, reminiscent glow. Chad Henderson, of Henderson painting, and Matt Vennoy, with NorCal Floor Design, helped take on the challenge of stains and lacquers (or lack there of). “The applications to the wood floors, ceilings, beams and door trim were applied using all zero-VOC paints,” says Milne. “The European wide plank floors are engineered to the highest standards of efficiency and sustainability, finished with natural oils using a thermo-treated process to react within the tannins of the wood to achieve warm, rich colors without chemicals or dyes.” That was in addition to innovative use of beeswax and carnauba wax, which created the glaze lacquer finish. While Milne was admittedly “hands-off” during that process, she made up for it with her Gray’s Crossing home. Two years prior to building, Milne began creating her “bible.” Cutting pictures like coupons and labeling concepts from a variety of magazines and media, she constructed a five-inch-thick binder of colors, cabinets, shapes, woods, materials and outdoor stimuli that she shared with the various contractors who worked on the project. 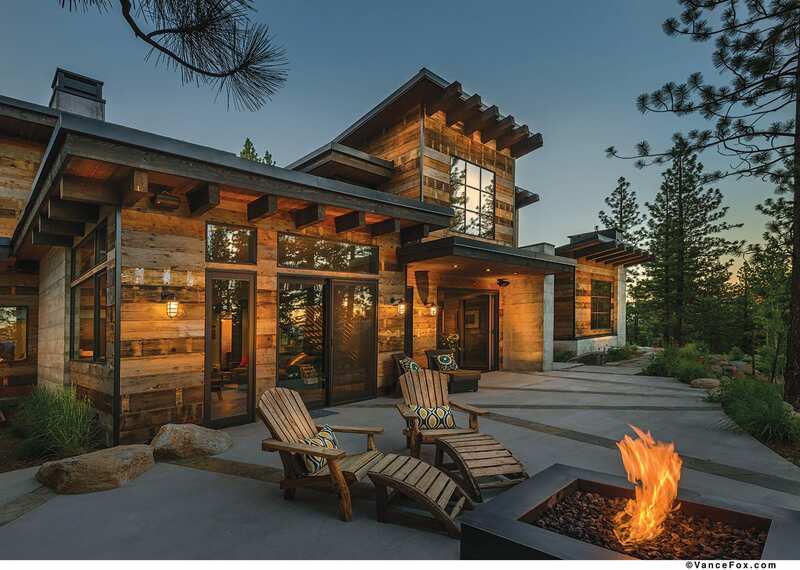 The home is sited to enjoy an elevated view of Northstar California. Passive solar gain assists in keeping the home at a comfortable temperature, and the backyard, consistently flooded with rays, is visible from the home’s living areas. Sliding glass doors border the south side of the great room, allowing the family to easily move from couch to what they call “the big outdoor room” beyond. The streamlined landscape flows from the open-air fireplace to the outdoor fire pit to the old fire road trail the Milnes travel to visit neighbors. Creating compartmentalized spaces within an open first floor plan, sans any partitions aside from a staircase, proved difficult, but the result was worth the trouble: accessible rooms, aesthetically pleasing from unlimited angles. The staircase, created by Truckee’s Don’s Welding, divides the great room from the dining space, which is essentially a long, wooden gathering table balancing out the polished gleam of the kitchen. “There’s a subtle separation with the stair—Jill can be in the kitchen and Shawn has the ability to watch a sports game in the great room yet they’re still connected as a family,” Gillespie says. Daily life influenced the open kitchen and all-encompassing island. The Caesarstone countertop covers the completely utilized base, which integrates the wine fridge, garbage and separate recycling disposals. A drop-down dry sink next to the main dual bowl sink allows a place for extra dishes (a practical convenience to the parents of an eight and five-year-old). The kitchen is positioned for easy entertaining as well as to take in views of the outdoors, for both the peace found in nature’s ambiance and, more practically, the supervision of two young children. If the kitchen is the heart of this home, the soul is the hearth flanking the first floor. The great room is home to the main blaze; protruding from the southeast corner, a benched fireplace warms the sunroom—a quaint yet complicated area that acts as den, office and nook. Clever placement of shelving, tables, toy boxes, hidden electronics and an armless lay-flat sofa sleeper (capable of facing any which way) maximizes the quarters. The whole-home speaker system can be controlled by phone, following the family’s desire to conceal technology. Keen bits of artistry are found around the home: Behind the sliding barn door of the guest bath, the room’s unique tiling is made from recycled concrete. Magnetic steel plates are placed in the lofted playroom, the sunroom and other fun spots to encourage creativity. The reclaimed wood is willingly being imprinted with the life happening around them. Upstairs, the family’s spaces are separated into the master suite and the kids’ area—two bedrooms, a laundry and lounge. The independent spaces that collaborate as a whole makes for a beautifully fresh breath, clean air for the Milne family to enjoy.